Three years ago, a University of Utah-led team discovered that an ultra-compact dwarf galaxy contained a supermassive black hole, then the smallest known galaxy to harbor such a giant black hole. The findings suggested that the dwarfs were likely tiny leftovers of larger galaxies that were stripped of their outer layers after colliding into other, larger galaxies. Now, the same group of astronomers and colleagues have found two more ultra-compact dwarf galaxies with supermassive black holes. Together, the three examples suggest that black holes lurk at the center of most of these objects, potentially doubling the number of supermassive black holes known in the universe. The black holes make up a high percentage of the compact galaxies' total mass, supporting the theory that the dwarfs are remnants of massive galaxies that were ripped apart by larger galaxies. "We still don't fully understand how galaxies form and evolve over time. These objects can tell us how galaxies merge and collide," says Chris Ahn, doctoral candidate in the Department of Physics & Astronomy, and lead author of the international study that published Monday in The Astrophysical Journal. "Maybe a fraction of the centers of all galaxies are actually these compact galaxies stripped of their outer parts." The authors measured two ultra-compact dwarf galaxies, named VUCD3 and M59cO, that lie far beyond the spiral arms of our Milky Way, orbiting massive galaxies in the Virgo galaxy cluster. They detected a supermassive black hole in both galaxies; VUCD3's black hole has a mass equivalent to 4.4 million suns, making up about 13 percent of the galaxy's total mass, and M59cO's black hole has a mass of 5.8 million suns, making up about 18 percent of its total mass. By comparison, the monstrous black hole at the center of the Milky Way has a mass of 4 million suns, but makes up less than .01 percent of the galaxy's total mass. "It's pretty amazing when you really think about it. These ultra-compact dwarfs are around 0.1 percent the size of the Milky Way, yet they host supermassive black holes that are bigger than the black hole at the center of our own galaxy," marvels Ahn. To calculate the ultra-compact dwarf galaxies' mass, the astronomers measured the movement of the stars using the Gemini North telescope located on Mauna Kea volcano in Hawaii. The astronomers have to correct for the distortions caused by Earth's atmosphere. They shot a laser into the sky to make a fake little star, and moved a mirror around hundreds of times a second to undo the distortion. They then applied the technique to the ultra-compact dwarf galaxies, which are so small that the corrections are necessary to measure the motions inside the object. The technique, known as adaptive optics, brings the once blurry galaxy into focus. They also analyzed images from the Hubble Space Telescope to measure the distribution of the stars in each galaxy, and created a computer simulation that best fit their observations. They found that the motion of the stars at the center of the galaxies moved much faster than those on the outside, a classic signature of a black hole. VUCD3 and M59cO are the second and third ultra-compact dwarf galaxies found to contain a supermassive black hole, suggesting that all such dwarfs may harbor similarly massive light-sucking objects. Astronomers discovered ultra-compact dwarf galaxies in the late 1990s. The objects are made up of hundreds of millions of stars densely packed together on an average of 100 light years across. Scientists took measurements to see what was happening inside the galaxies, and something didn't add up; the ultra-compact dwarf galaxies had more mass than their stars alone could account for. Senior author Anil Seth, assistant professor in the Department of Physics & Astronomy at the U, led the 2014 study that found the first ultra-compact dwarf galaxy with a supermassive black hole. The two U-led studies make a strong case that supermassive black holes at the center of the galaxies are responsible for the extra mass. An alternate theory of the dwarfs is that they are just really massive star clusters — groups of a hundred thousand stars born at the same time. The largest star cluster in the Milky Way is three million stars, and ultra-compact dwarf galaxies are 10 to 100 times bigger than that. "The question was, 'Is that because they form bigger star clusters with the same process? Or are they different in some way?' This work shows that they are different," Seth continues. "It's obvious in retrospect, because the center of a regular galaxy looks almost exactly like these objects, but that wasn't what most people thought they were. I wasn't convinced that we were going to find a black hole when I took the observations," says Seth. "This is a cool example of scientific discovery and how quickly you can reorient our understanding of the universe. Black holes are areas with such strong gravity that not even light can escape. They form when stars collapse, leaving behind a black hole with dense mass that exerts gravitational force on the objects around it. Supermassive black holes have a mass of more than 1 million suns, and are thought to be at the center of all big galaxies. One explanation for the supermassive black hole inside the ultra-compact dwarf galaxies is that the galaxies were once made up of billions of stars. The authors believe that the dwarfs were "swallowed up" and ripped apart by the gravity of much larger galaxies. 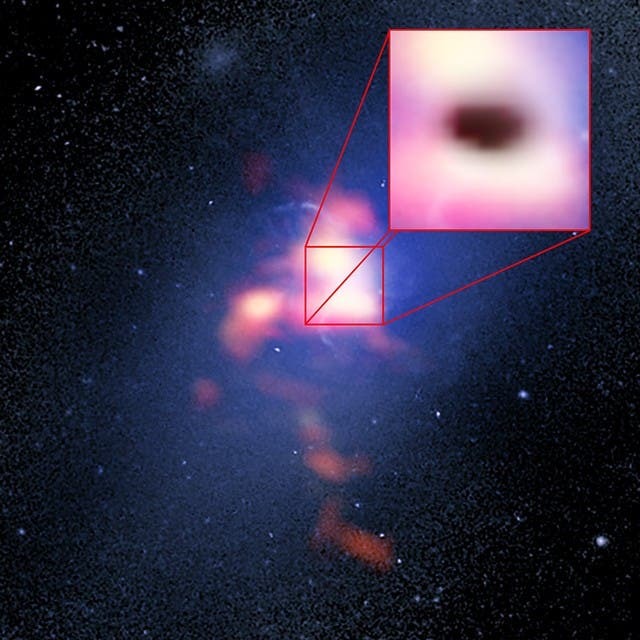 The ultra-compact dwarf black hole is the remnant of its formerly massive size. The findings change the way that astronomers can piece together how galaxies form and evolve over time. "We know that galaxies merge and combine all the time — that's how galaxies evolve. Our Milky Way is eating up galaxies as we speak," says Seth. "Our general picture of how galaxies form is that little galaxies merge to form big galaxies. But we have a really incomplete picture of that. The ultra-compact dwarf galaxies provide us a longer timeline to be able to look at what's happened in the past." For First Time We Have the Technology to Observe Milky Way's Supermassive Black Hole — "Can Spot a Golf Ball On the Moon"